On July 6, 2004, the Advisory Council on Historic Preservation (ACHP) published revised regulations implementing Section 106 of the National Historic Preservation Act. The revised regulations, published as 36 CFR Part 800, Protection of Historic Properties (Federal Register Volume 69, Number 128), took effect on August 5, 2004. The ACHP provides a detailed outline of the most recent changes, as well as general guidance on the Section 106 review process on their website (see below). Due to the increased emphasis on public involvement, the ACHP has issued a pamphlet entitled Protecting Historic Properties: A Citizen's Guide to Section 106 Review. As noted in the opening paragraphs, "Section 106 review is your opportunity to alert the Federal Government to the properties you value and to influence decisions about the Federal projects that affect them." Copies are available from the HPO, and are also available electronically from the ACHP website. As a result of the tropical storm that blew through New Jersey on September 16, 1999, eight counties were included in a presidential emergency declaration, entitling them to assistance by the Federal Emergency Management Agency (FEMA). HPO staff worked closely with FEMA to expedite the Section 106 review necessitated by the use of federal funds to repair flood damage. 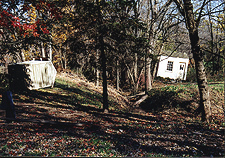 To help FEMA identify historic properties that may have been affected, the HPO provided lists of contacts for local historical societies, and made immediate emergency site visits. By working closely with FEMA's cultural resource specialist and relying on e-mail, the HPO was able to provided response times of 24 hours or less in many cases. This expedited process ensures that many historic sites will be returned to "pre-storm" condition with needed funds. HPO staff also worked closely with county and local officials to ensure that historic bridges were repaired quickly without harm to their historic character. The former Erie Lackawanna Railroad and Ferry Terminal at Hoboken represents a hallmark of Beaux-Arts design. Completed in 1903, the copper-clad facility had fallen into disrepair by the time NJ Transit was formed in the early 1980's. 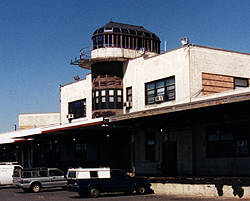 NJ Transit consulted with the HPO under Section 106 for many independent repair and rehabilitation projects at the Terminal throughout the 1980's and 1990's. Realizing the historic significance of the Terminal, and faced with the complexity of needed repair, NJ Transit decided to take a programmatic approach to the management of the Terminal. With input from HPO staff, the agency initiated several planning and preservation studies intended to guide current and future work at the facility. Central to those plans was the rehabilitation of the main waiting room, which developed out of a number of smaller waiting room repair projects. The waiting room at Hoboken Terminal is a grand two-story space highlighted by a magnificent stained-glass sky- light. 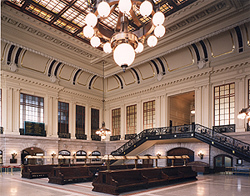 The restoration, completed in late 1999, involved restoration of the ski-light, restoration of original wall and ceiling finishes, re-creation of original lighting fixtures, restoration of the passenger benches, re-creation of the ornate terrazzo floor, including an innovative sub-floor radiant heating system to improve passenger comfort and correct long-standing heating problems in the waiting room. In 1980 The New Jersey Historic Preservation Office prepared a nomination for the early buildings of Newark Airport, including the 1935 Airport Administration Building (now called Building 51). When Building 51 was completed, Newark Airport was arguably the most important airport in the world. Amelia Earhart was on hand when the ribbon opening the building was cut. Charles Lindbergh kept his personal plane at the airport, and all airmail to and from the east coast came through Newark Airport. Twenty years later, in the year 2000, the Historic Preservation Office worked with the Port Authority of NY & NJ and the Federal Aviation Administration to save the historic Airport Administration Building. During the late 1990’s, the Port Authority had requested approval from the Federal Aviation Administration (FAA) to lengthen the main runway at Newark Airport. At that time, the Historic Preservation Office, consulting with both the Port Authority and the FAA, sought to ensure that the old Airport Administration Building, which sits at the north end of the main runway would be protected for the future. Because of its location at the end of the lengthened runway, it became impossible to provide public use of Building 51 in its historic location with airplanes taking off and landing just in front of the building.